Cadabra Records has, by this point, solidified themselves as the forerunners in the genre of spoken word arts. Not that they have a ton of competition in this field, but even if that were the case, the works that they have been creating could only be described as premium in every element. Each chosen theme is given the absolute best presentation one could hope to find. Original album artwork, professional well-rehearsed readings and soundscapes that give the perfect atmosphere to each reading all come together in a packaging that is itself top-notch. For myself, as well as for readers of This Is Darkness, the selections by H.P. Lovecraft have been the most appropriate to cover. The connections between H.P. Lovecraft’s works and the dark ambient scene run incredibly deep, with inspiration from his works going far back in the history of the genre. Though currently, more so than ever before Lovecraft is a prime inspiration for the dark ambient musicians and their albums. I could give a pretty lengthy list of all the tracks and/or albums of the last few years which have been inspired by Lovecraft or one of his weird contemporaries. While Theologian doesn’t often tap into the energies of Lovecraft in his solo albums, he has become the face of the Lovecraft collection from Cadabra Records, contributing his brilliant and haunting soundscapes to most of the Lovecraft releases on the label. Fungi from Yuggoth is no exception in terms of energy or quality. Theologian again seeks to top his previous output on Fungi from Yuggoth and wholly succeeds in adding the perfect score to this beautiful collection of weird poems. Fungi from Yuggoth is almost universally agreed to be the most successful collection of H.P. Lovecraft’s poetry. Where Lovecraft had previously written a large swathe of verse about everything from epic ancient Greek mythology to short and playful poems often included in greetings cards to his correspondents, Fungi from Yuggoth taps directly into Lovecraft’s knack for cosmic horror and weird fiction. We are given short fleeting glimpses of many of Lovecraft’s most recognizable components of his corpus of weird works. With an emphasis on the word “charmed” Leman gives extra attention to the fact that Lovecraft was a life-long bibliophile. When writing this poem, Lovecraft surely would have been day-dreaming of how wonderful it would feel to actually discover a collection of books, all but lost to history, which told of occult secrets and ancient forgotten aeons. He would have equally felt the same exhilaration when removing one of these dusty tomes from the collection and spiriting it off to his home for further investigation. By the third poem, “The Key”, the protagonist has made it home with this book and is now able to greedily consume its ancient knowledge within the privacy of his own home. Again, Leman’s recital of this poem and the emphasis on certain sections bring the story to life, giving it a level of emotional depth which surely would have made Lovecraft smile. In the last two lines we hear the greed of the protagonist in successfully getting home with the book, but we also hear the fear that immediately sets in as he realizes he might not be alone after all. Whereas the first few poems seem to build a sort of narrative, giving a foundation to the collection, later we are presented with snippets of plots which are further elaborated upon in Lovecraft’s prose. Two of these particular poems, “Azathoth” and “Nyarlathotep” give accounts of several of Lovecraft’s ‘Outer Gods’. The “Nyarlathotep” poem works in a similar way to its prose-poem counterpart of the same name. It gives an account of Nyarlathotep’s emergence from Egypt and the ensuing chaos which befalls humanity at his hands. Taking Nyarlathotep to be the messenger for Azathoth, as he has been described in several stories, the poem “Azathoth” seems to describe the narrator/protagonist of the Fungi from Yuggoth collection being taking into the depths of unimagined space by Nyarlathotep to witness his master, Azathoth. The poem ends interestingly with an elucidation of how these two gods interact with one another. As in contempt he struck his Master’s head. When I was approached by Cadabra Records to illustrate H.P. Lovecraft’s Fungi from Yuggoth, a sequence of 36 sonnets, my mind was immediately flooded with fleeting and horrifying glimpses of Lovecraft’s universe. As if these denizens had been patiently waiting in my sub-consciousness to be summoned. Barnett went on to create a beautifully realized landscape painting which would be included as a whole on the inner two panels of the package as well as on a large 24″x36″ promotional poster which comes with purchases of the album directly bought from the Cadabra Records online store. This landscape artwork is brilliantly detailed with images of many of the elements from the Fungi from Yuggoth collection, including among many other things, the statue of Cthulhu, Nyarlathotep emerging from his tomb, Azathoth descending upon fog enshrouded mountains and the night-gaunts traversing the skies. While the outer-cover of the release is greatly darkened and subtle, the painting is certainly one of the best to-date from a Cadabra release. As with most Cadabra releases, there are a number of different variants of Fungi from Yuggoth. The box-set edition, as usual, is the most impressive, with black swirls on clear vinyl making for an incredibly gorgeous album, probably one of the nicest variants of a vinyl I’ve seen to-date. 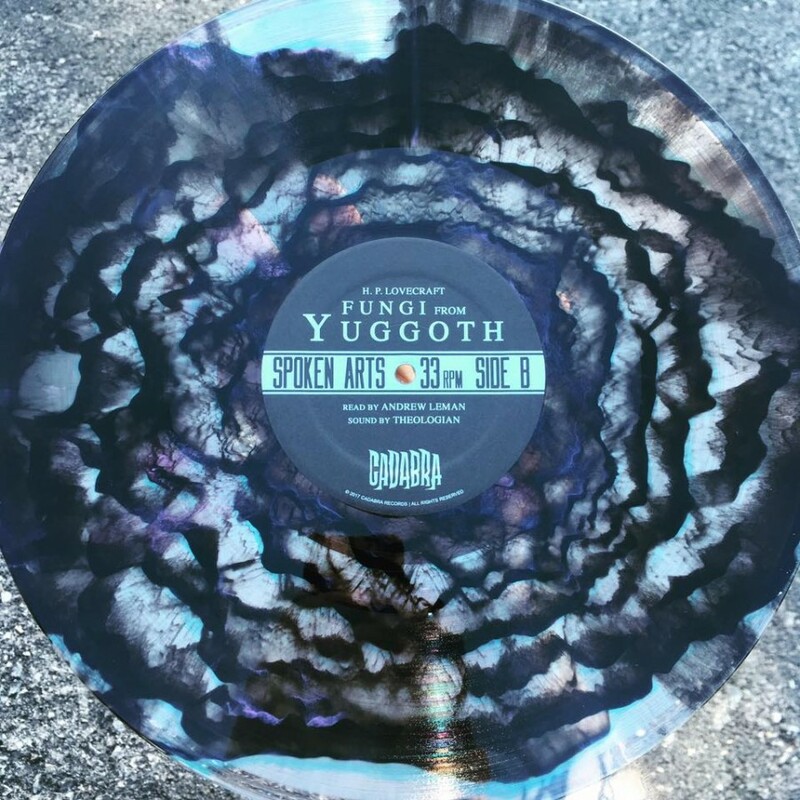 To regular buyers, there are two options: the “Night-Gaunts” variant which is metallic silver and the “Nyarlathotep” variant which is a light blue and white opaque mix. The packaging is a thick sturdy cardboard which should withstand years (dare I say aeons) of storage without deterioration. It seems with almost every Cadabra release I cover I must make this statement, and here again it is in order: this is one of my absolute favorite releases of the year, one of the best releases yet by Cadabra Records and absolutely worth the highest recommendation for fans of the works of H.P. Lovecraft, Theologian or both. Cadabra continues to put quality at the forefront of their consideration when releasing albums and seem to have no intentions of letting up on this rigid adherence to detail above all else. A highly recommended release!